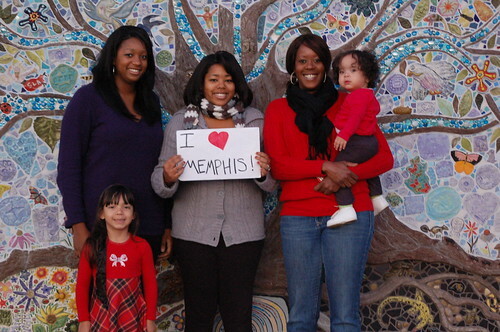 A few months ago, I took a family I Love Memphis picture at Cancer Survivors Park in front of the huge mosaic. The mosaic is called “Tree of Life” and it incorporates tiles made by cancer survivors and their families. It was made by local artist Kristi Duckworth. 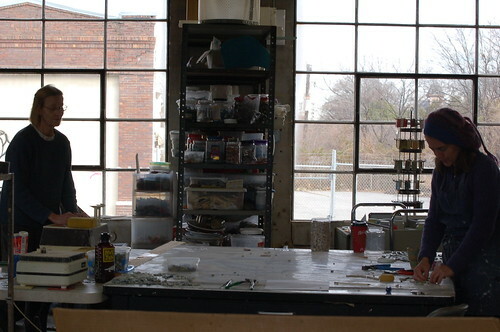 Duckworth creates her mosaics at her studio, a big, sunny midtown building called Garden Path. Her work is largely inspired by nature. When I stopped by last week, she and a friend were working on a privately commissioned mosaic for a concrete entryway. They were pulling tiles from small tubs and fitting them onto a grid with a color drawing of the final design (a big blue octopus) underneath it. 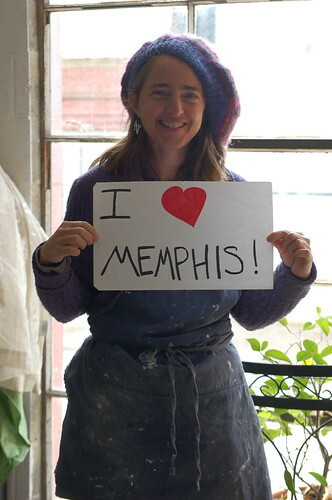 Working at Garden Path Studio, Memphis, Tenn.
To create her mosaics, Duckworth first draws them onto cardboard. The tiles are then carefully laid onto the cardboard. To move them from Garden Path to their final location, they’re picked up with heavy duty contact paper. Duckworth has been creating for more than 20 years and frequently teaches classes for the Hutchison Academy of Excellence, home school students, and school art classes. For the mosaics she’s done at schools (including White Station), she’s had students create their own tiles to be used in the final product. For more information on Garden Path Studio and, visit Duckworth’s web site.